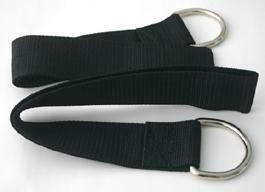 Click for larger A different take on the standard sling, this webbing sling provides great comfort, and the ability to adjust the head position by selecting your preference of mounting points. Made of a combination of nylon and polypropylene webbing in 3 inch and 1 1/2 inch widths, it is securely box stitched at all points, and has been tested to hold 200 pounds under rough treatment. You shouldn't have a problem holding larger weights, we just don't have anyone larger handy! Sorry the photos didn't come out all that great - we'll take others.